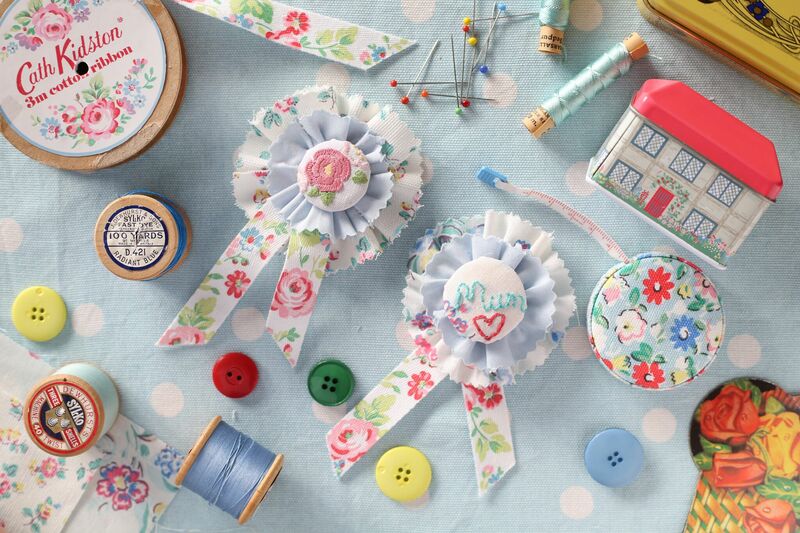 We made our rosette using Cath Kidston fabric and ribbon and decorated the center with an embroidered button saying Mum. We made an alternative version by covering the button with a piece of vintage embroidery found in a charity shop. We sewed on a safety pin but you can use stick on magnets and put the rosette on the fridge. Draw round the button on the back of your floral fabric, add an outer circle about 1cm wider than the inner circle. Turn the fabric over and in water erasable pen write the word mum and draw a heart. Using a back stitch, and blue thread embroider over the word mum. Embroider the heart in red. Sew a line of gathering stitches near the edge of the embroidered circle. Insert the button and gather up the stitches and finish with a knot. Turn the button over to admire your work. Gather the stitches up to form a circle. Tie off the ends. Repeat steps 7 and 8 but this time with a piece of plain blue fabric 2.5cm wide x 21cm long. 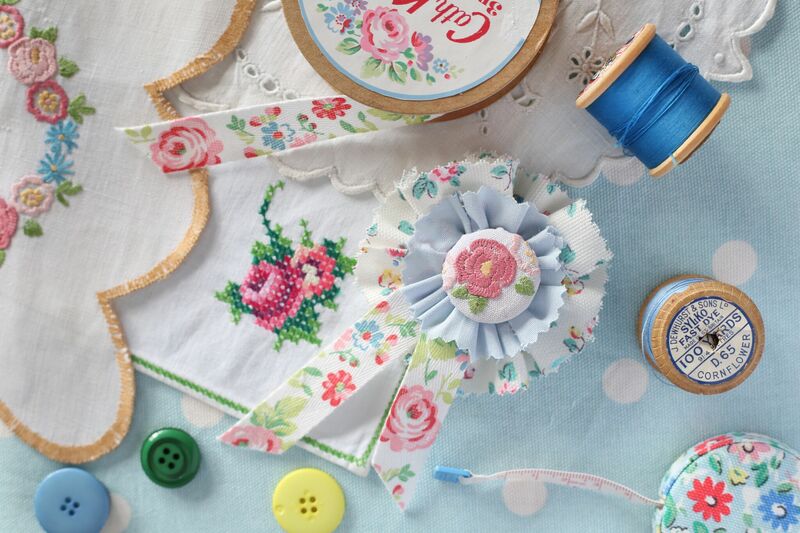 Sew the blue rosette onto the floral one at their centers. Sew the covered button on top of the double rosette. Cut a piece of ribbon 19cm long. Fold it in half and then sew it onto the back of the rosette. Sew a safety pin onto the center of the back of the rosette. To neaten the back cut a small piece of ribbon, turn the ends under and cover all the bits of sewing on the back of the rosette. Give it to your mother for Mother’s day.